Happy Friday Everyone!! I am so glad that the weekend is here. It's challenge day over at Paper Cutz Challenge. 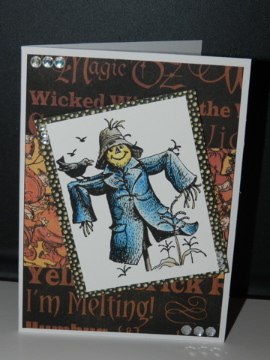 This week's challenge is "Keeper of the Crows" Make a card, LO or craft project for Fall using a hand stamped, digital stamped, or Cricut cut image of a scarecrow using Orange, Yellow, Brown, Black, Blue and White ONLY! For my project, I decided to make a card. I did not have any images of crows, so I googled scarecrows images and I came across free digital images. I am not good at coloring with markers, so I colored my image with Prism color pencils and mineral spirit. I love how it came out. I used a card base from a pre-scored card pack I got from Hobby Lobby. I finally got the chance to use the Magic of Oz Graphic 45 paper pack. For some added embellishment, I used some Recollections Rhinestones. Awesome image and you did great with the coloring!